Anne of Cleves (September 22, 1515 – July 16, 1557) (German: Anna von Jülich-Kleve-Berg) was the fourth wife of Henry VIII of England from January 6, 1540 to July 9, 1540. Their brief marriage was a political one, and Henry seems never to have been attracted to her physically once he saw her in the flesh. Knowing the fate of other wives of Henry who resisted his marital whims, Anne did not resist when Henry wanted to annul the marriage, which was reportedly never consummated. For her cooperation, she was rewarded with property and other financial support. She elected to remain in England after the divorce and developed a friendly relationship with Henry, including being given frequent access to the royal children. She was particularly important in the process of Henry's reconciliation with his daughter Mary, who would later become queen. Anne died in London in 1557, aged 42, surviving both Henry and his son, Edward VI. Despite the failure of her marriage, she is considered the happiest of Henry's six wives. Anne was born at Düsseldorf, the daughter of John III, ruler of the Duchy of Cleves, who died in 1538. After John's death, her brother William became Duke of Jülich-Cleves-Berg, bearing the promising epithet "The Rich." In 1526, her elder sister Sybille was married to John Frederick, Elector of Saxony, head of the Protestant Confederation of Germany and considered the "Champion of the Reformation." At the age of 12 (1527), Anne was betrothed to Francis, son and heir of the Duke of Lorraine while he was only ten, so the betrothal was not considered official. The family's politics made them suitable allies for England's King Henry VIII in the aftermath of the Reformation, and a match with Anne was urged on the king by his chancellor, Thomas Cromwell after the death of Henry's third wife, Jane Seymour. The artist Hans Holbein the Younger was dispatched to paint portraits of Anne and her sister Amelia, whom Henry was considering for the role of his fourth wife. Henry hired the artist to be as accurate as possible, not to flatter these sisters. Holbein was a superb portrait painter, and there is reason to believe his attractive portrayal of Anne was true. Even though Henry was not attracted to Anne once her met her, Holbein remained at court and continued to win royal commissions. His portrait of Anne is currently displayed in The Louvre in Paris. Negotiations with the Cleves' court were in full swing by March 1539. Cromwell oversaw the talks and a marriage treaty was signed on October 4 of the same year. A possible obstacle may have been that Henry valued education and cultural sophistication in women, but Anne lacked these in her upbringing. She received no formal education as a child; and instead of being taught to sing or play an instrument, she was skilled in needlework. She had learned to read and write, but in German only. 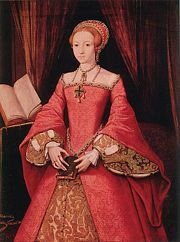 Nevertheless, Anne was considered gentle, virtuous, and docile, qualities that made her a realistic candidate for Henry. 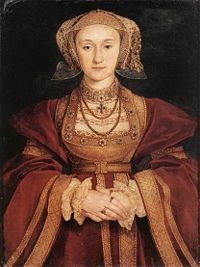 Moreover, Henry's previous wife, Jane Seymour, also lacked a sophisticated education, but this had proved no barrier to her success as a companion to Henry or to providing him with an heir. Henry, impatient to see his future bride, journeyed to Rochester, Kent on New Year’s Day 1540 and walked in on Anne unannounced. 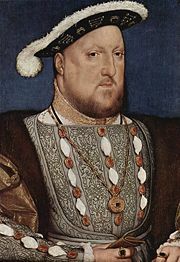 Without the benefit of a portrait of Henry to prepare her for his appearance, she did not realize that the intruder was to be her future husband, so she did not curtsy or even rise from her chair when Henry entered the room. The king reportedly took an immediate dislike to her and announced: "I like her not." Henry urged Cromwell to find a legal way to avoid the marriage but, by this point, such an outcome was impossible without offending the Germans. The two were married on January 6, 1540, at the royal Palace of Placentia in Greenwich, London by Archbishop Thomas Cranmer, despite Henry's vocal misgivings. If his bride had objections, she kept them to herself. The phrase “God send me well to keep” was engraved around Anne’s wedding ring. Henry was frustrated, and he took out his feelings on Anne. He was described as trying repeatedly to upset her by sending away her personal ladies-in-waiting from Cleves and replacing them with Englishwomen instead. However, Anne made friends quickly and soon enjoyed the lively company of the English maids of honor who attended her. Henry also ordered that she put aside her traditional and cumbersome Germanic clothing and adopt more streamlined English styles. She liked this idea and immediately ordered a large, lavish wardrobe, straining Henry's finances. He commanded that she speak only English and arranged for her to be tutored intensively. She learned English with amazing speed, so much so that the king was reportedly shocked. Regarding her virginity, which Henry had questioned because of her supposedly sagging belly and breasts, she answered with a naivety that betrayed a basic ignorance of the facts of life. "I surely cannot be [a virgin], because every night when the King comes to bed, he kisses me on the cheek and says 'Good-night, sweetheart.' Then he goes to sleep. In the morning, when he rises, he kisses me on the cheek again, and says 'Have a good day, sweetheart.' So you see, I cannot still be a virgin." When Anne heard about real sexual relations as described by her maids, she was amazed, and stated that nothing like that had passed between her and the king, or between her and any other man. This news, rapidly spread, made Henry a laughing stock to his people. Anne was commanded to leave the king's court on June 24, 1540, and on July 6, she was informed of her husband's decision to reconsider the marriage. In a short time, Anne was asked for her consent to an annulment, to which she agreed. The marriage was annulled on July 9 on the grounds both of non-consummation and of her previous contract to Francis of Lorraine. She received a generous settlement, including Hever Castle, home of Henry's former in-laws, the Boleyns. Anne of Cleves House, in Lewes, Sussex, is just one of many properties she owned, but she never lived there. Made a Princess of England and called "the King's Beloved Sister" by her former husband, Anne remained in England for the rest of her life. Sir Horace Walpole, writing in the eighteenth century, resurrected the myth which described Anne as "The Flanders Mare"—a monument to her supposed ugliness. This view persisted, and it is still a popular stereotype. Most modern historians, however, disagree with it, and the Holbein portrait certainly contradicts Walpole. Portraits other than the famous Holbein miniature portray the same face—strongly featured, with a large nose. Another theory suggests that Henry and Anne agreed that they simply did not get along well with each other. Anne had been raised in the small provincial court at Düsseldorf and shared none of the musical and humanistic literary tastes of Henry's court. Another theory suggests that shifts in a threatened Catholic French-Spanish alliance removed any diplomatic motivations for their union. Finally, there is a theory that the marriage was politically inconvenient because of the growing hostility between Henry and the duke of Cleves. 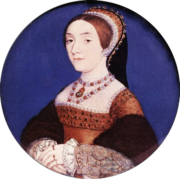 Anne never overtly resented Henry's new wife, Katherine Howard, but actually was fond of her, first as her own maid of honor and later when she became Henry's fifth queen. Anne was said to be genuinely distressed by Katherine's fall from grace and execution on grounds of adultery and treason. However, Anne reportedly did not like Katherine Parr, Henry's sixth wife, whom she considered far less attractive than herself. Anne adamantly desired to stay in England after her annulment. She thus fully cooperated with Henry, supporting his claims, and probably testified that her marriage had never been consummated, as well as that her previous betrothal to the son of the Duke of Lorraine had never been legally broken. She gratefully accepted Henry's offer of several houses, a princely income, and the honorary title of "the King's Beloved Sister." She also accepted the condition that, having been the king's wife, she would not be permitted to remarry. Anne of Cleves enjoyed a close relationship with the royal children, especially the young Elizabeth. Anne did not wish to return to her home and risk being married off to another ally of her brother. Like a number of women of her time, she may have tired of being a political pawn through marriage. She returned her wedding ring to Henry, requesting that he break it in half to symbolize that the bond between them as husband and wife was broken. The was one matter, however, on which she insisted. Anne consented to the annulment only after the king allowed her to have access to the royal children. She had formed strong attachments to all three of them, particularly Elizabeth. As she could never remarry and was thus denied the chance to have children of her own, Henry agreed. As a tribute to her prudence and good sense, even allowed Prince Edward, the royal heir, to visit her on occasion. Anne happily retired to the various country homes that Henry had given her and ended up with an income of £4,000 a year, the manors of Bletchingly and Richmond, Hever Castle, and the status of fourth lady in the kingdom (after any queen, the Lady Mary, and the Lady Elizabeth). She occupied herself with refurbishing the estates and other domestic occupations that were her chief interest. Later in life, she converted to Catholicism, to her step-daughter Mary's delight. She founded an orphans' school on one of her estates, and she was frequently at court—where she became one of her "brother," King Henry's favorite visitors. It seems they had much in common, particularly an interest in upgrading and modernizing their houses. They frequently exchanged cooks and household gadgetry. Thomas Cromwell was less fortunate. His enemies, taking advantage of his misfortune in arranging of Anne's ill-fated marriage to the king, managed to persuade the king of his treason and heresy. He was imprisoned and executed on the same day as the king's marriage to his fifth wife, Catherine Howard. Anne died peacefully in 1557, aged 42, surviving both Henry and his son, Edward VI. Meanwhile, her step-daughter Mary had become queen. Anne's influence as queen was generally much less than her predecessors. However, she managed to make good personal relationships with each of the royal children, who had up until that time, been raised largely in isolation by servants. Later, she became particularly important in the process of reconciliation between Henry and Mary, his first daughter. She apparently loved each of the royal children sincerely which gave them affection and support when they had little. Of all of Henry's wives, Anne of Cleaves was probably the most fortunate. Though a failure as a wife, she earned the king's respect and affection, and was able to live out her life in relative happiness. ↑ At the time, the area was in the Duchy of Cleves. ↑ 2.0 2.1 Geocities' article on Anne of Cleaves www.geocities.com Retrieved May 11, 2008. ↑ 3.0 3.1 Biography Channel www.thebiographychannel.co.uk Retrieved May 11, 2008. ↑ May 3, 2004: Biography of Katherine Howard www.geocities.com. Retrieved May 13, 2008. PBS handbook on "The Six Wives of Henry VIII: Jane Seymour 1508-1537" www.pbs.org. Retrieved May 12, 2008. History of "Anne of Cleves"
This page was last modified on 23 March 2016, at 15:21.